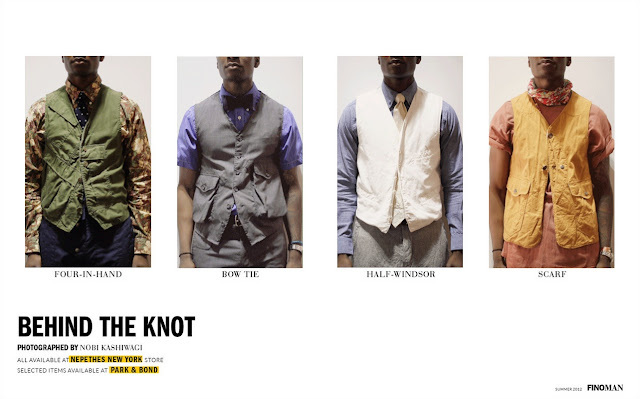 Our good friend Nobi Kashiwagi recently shot an editorial titled 'Behind The Knot' for the magazine Fino MAN. This shoot showcases various ensembles of neckwear using products from Engineered Garments, Needles, Rough & Tumble and a few other lines, all of which are available at our shop. Click the image above the view the piece on their site and check out the individual how-to clips and product information below. Note: If the .GIFs below are static, click on one of the images to start and the rest should follow.